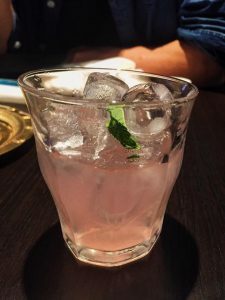 If you happen to follow the lifestyle side of my blog, it will be no secret to you guys that I love to indulge in eating out, or even just food in general. As Saturday night swiftly approached after the long grind of a week, of course I would use any excuse to use date night as an opportunity to eat out in a lovely restaurant. 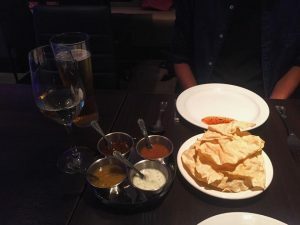 Spending the past 5 days in Central London, I took it upon myself in finding a perfectly delectable restaurant close to home, which attended to our taste buds equal to the four star plus eateries would do in the big city. Of course, to my delight, I found the hidden gem that was Bonoo, situated in the heart of West Hampstead, North London. Now, this restaurant was particularly peculiar to me, as knowingly, many food establishments take a customary hit on Trip Advisor, to the odd grumpy customer whose food was five minutes two late, or perhaps a waiter dropped a glass too loudly next to a certain unwelcome table. However, Bonoon, an exemplary restaurant, took its stance of elegance, had a strong rating of five star, with an exception of one bad review and one three-star review. Now this was a first. 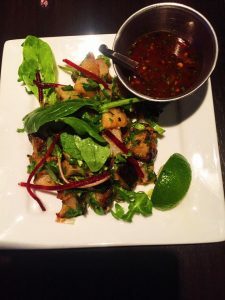 I had heard of Indian tapas before, but knew it was a rare method of dining, and was eager to try. As myself and my boyfriend entered this restaurant of such grace and style, the aroma of authentic spices and flavours hit our sinuses and we became excited at the food that awaited us. We were led downstairs away from the kitchen and the room developed a smell of fabric softener – strange edition to remember, I know. 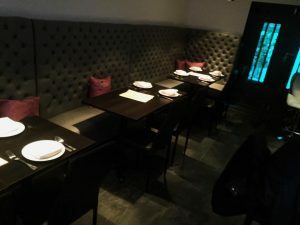 The restaurant embraced modernity through the neon blue LCD lighting and the fine designed tables and chairs, but there was an ongoing playlist of Indian music in the background which preserved the authenticity. There was a delightful host waiting for us downstairs, who was very attentive to what we needed and assisted to the complex, but riveting menu. To start we were brought crispy poppadum’s with their special blueberry chutney which tasted absolutely divine. This was followed by my favourite part of the meal which was a Sarvis Lamb Kathi Roll which was enriched in Indian spices and struck our taste buds with the perfect amount of chilli. Usually I’m not a fan of lamb – strictly chicken- however this was an exception. I was in my element. Another special edition that was brought to the flawless table was the Aloo Fire cracker, which was potatoes tossed in butter, lime, aromatic seeds and hot chilli. This dish had the perfect amount of crisp to the potato which coincided impeccably with its mouth-watering marinade. 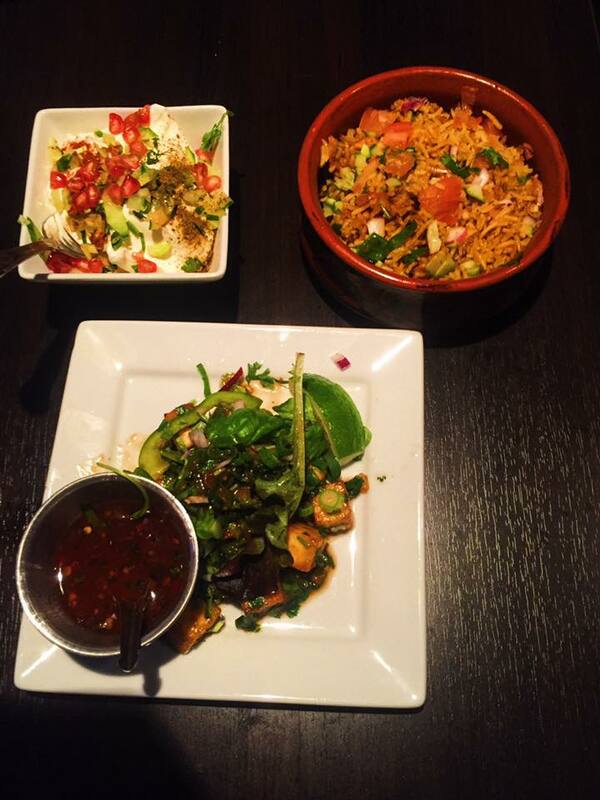 The beautiful thing about tapas, is when you are enjoying a dish so good there is always more to come. Dished up in small plates, allows you to appreciate the appetizing taste of each dish without an intense bloated feeling after a main dish. Enthusiastic to eat more, we were brought the final dishes of the evening. 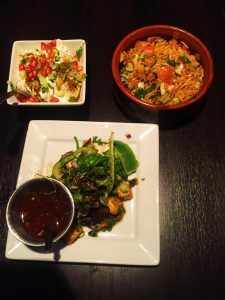 A warm chilli paneer which was Indian cheese tossed in sweet chilli and tamarind sauce with peppers and spring onions, and a biriyani dish, Murgh Tikka Biriyani which was chicken marinated in masala cooked in basmati rice, with a side of pomegranate raita. I felt so content and blissful with the meal. The perfect amount of spice and zest was created in the meal, complimented with rose infused white wine with elements of berries in the flavour. In addition to our fantastic meal, to our surprise and delight we were offered a complimentary beverage at the end of the meal. If you are looking for a restaurant to taste a variety of dishes and flavour, with class and sophistication, Bonoo is the one for you.